Wayne Knight, Gray's Sporting Journal Artistic Director, never cease to amaze us with his talent. He has yet again designed an incredible issue of this publication. This time he chose to feature Adriano's duck hunting still life paintings to complement a remarkable story by outdoor writer Art Isberg titled "The Accidental Apprentice". Outstanding! The April 2018 issue of the New York Conservationist has used one of my paintings "Big, Wide &amp; Long" for their cover art with excellent results. I'm extremely grateful to assistant Editor Eileen Stegemann and Editor Dave Nelson for this great opportunity and I'm very proud to have been selected by the official NY DEC publication to represent the beauty of my home state. ate last summer, I had the pleasure of speaking to Brooke Chilvers, a wonderful writer and art historian from Virginia, about a possible article on my work for Gray's Sporting Journal. I spent a few delightful hours talking to Brooke. A few months later I found out that an article would appear in the March/April Fly Fishing Edition. I was not ready but extremely pleased by what I saw when I got my copy of this publication this week. As always art director Wayne Knight did an incredible job with the layout. I'm thrilled and honored to have been selected for this feature. In February, Adriano attended a book signing for "On The Farm" with Ron Dodson, ISC-Audubon's President at Stonewall Farms in Keene, New Hampshire. The evening was coordinated by Antioch University president Steve Jones, his lovely wife Judy and his wonderful staff at the University. Over 100 people attended and Adriano, wife Teresa, and Ron had the opportunity to meet many of the faculty members, students, and alumni. A few weeks before the book signing, ELF, a New Hampshire weekly publication featured an article on Adriano's work. The article was exquisitely written by Nicole Colson. "Fair Maidens" is the image chosen to illustrate one of the excellent articles in the August 2014 issue of "Gray's Sporting Journal" (Volume 39-Issue 4). The angling still life was inspired by an old postcard in which two ladies anglers test their skills in an idillic setting. The simplicity of the setting is rendered dramatic by the use of the chiaro-scuro technique. Adriano's painting "Deep In Mysterious Lies" was featured in the juried art show "Slate as Muse" curated by Serena Kovalosky. Using slate as their creative muse, sculptors, painters, photographers and mixed media artists from throughout the United States offered innovative perspectives on a material that is usually found in functional settings. “Deep in Mysterious Lies" was inspired by a fishing trip the artist took to Quebec's Gaspé Peninsula in Canada, The Restigouche River is renowned for its rich salmon fishing, but what also attracted Adriano there was the promised beauty of a river where calcareous slate colors the water with jeweled hues. The colors that reflected in the water tinted by the slate bed were rich and mysterious in their depth and that is what the artist chose to represent in this painting. Adriano was also a panelist at the Roundtable discussion held on July 16 in conjunction with the show:The Creative Economy in the Rural Northeast: Can it Work? Ronald G. Dodson, Chairman of ISC-Audubon recently announced that Adriano Manocchia has been named the Official Conservation Artist of ISC-Audubon. Through this position with the not-for-profit ISC-Audubon, Manocchia will be working with the organization to generate awareness of the importance of conservation oriented landscape management at home, work and at play. As Official Conservation Artist, Manocchia will contribute through his art in raising awareness for the ISC-Audubon Conservation Landscapes for America Initiative, which is aimed at motivating people to become personally engaged in conservation and sustainability where they live, work, and play. The October/November 2013 issue of Southern Trout Magazine features Adriano's work and a wonderful review of his book Water, Sky & Time. The online publication can be viewed at http://www.southerntrout.com/mag/files/assets/basic-html/index.html#page1 The feature was written by Loryn Patterson and you'll agree with us that she did an outstanding job. Don't miss reading the rest of the magazine, as it's filled with interesting articles and outstanding photography. and while there, check the rest of the site. You will certainly enjoy it!!!! Adriano's painting "Letter From A Friend" is the perfect complement to the essay published in the July 2013 issue of Gray's Sporting Journal titled "July - A Fisherman's letter to his friend Chris D. and, really to all of us" written by author Todd Davis. The nostalgic tones of both the painting and written words introduce the readers to another outstanding issue of this classic publication. In this painting that measures 21"x36" Adriano has masterfully captured the grandiosity of a scene in which the angler is but a secondary element while the rich fall foliage and the sinuous Lamar River in Yellowstone National Park, noted for its trophy trout and for being the favorite destination of the Lamar Valley wolves pack, become the major subjects. The image was chosen to illustrate an essay by Mark Kingwell and reproduced into a two-page spread. The Trailside Galleries Wildlife Discovery show in the Jackson, WY location, runs for the entire month of march and celebrates all things natural and wild with new works from many of the top wildlife painters in the country. A new collection of Adriano's wildlife images were selected for this show including "Yellowstone Mist", a painting on canvas featuring an elk in a Yellowstone early morning scene. Gray's Sporting Journal Features "Trying a New Pattern"
The March/April 2011 issue of Gray's Sporting Journal, featured an angling still life painting created by Adriano on the inside back cover of their excellent publication. The original oil on panel, measures 10"x15" and is a splendid example of Adriano's unique nostalgic still life paintings. "Almost The Season" a western still life painting measuring 12"x9" has been selected to participate to the invitational 2011 American Miniatures show at Settlers West Galleries in Tucson, AZ. "A Time Before Catch and Release" is the angling still life selected for the February 2011 cover of Mid-Atlantic Fly Fishing Guide. An old photo of a bygone era when keeping the catch was still the normal practice, inspired this painting. Gray's Sporting Journal 2011 Expeditions & Guides Annual featured the painting by Adriano titled "A Visit To Silver Creek" in a two page spread for Western U.S. destinations. This painting is one of the all-time favored by Adriano's art collectors and a very fine example of the artist's rendition of angling landscapes. We are pleased to announce the fine sale results of a miniature oil by Adriano offered at the recent Jackson Hole Art Auction in Jackson Hole, Wyoming. The auction, organized by Trailside Galleries and Gerald Peters Gallery, took place on Saturday September 18th, 2010 at the Center for The Arts in Jackson, WY. The small 9” x 14” still life scene, entitled Summer Memories – Upper Falls, Yellowstone, sold for $4,600. It is the third year Adriano was invited to participate to this event in Jackson Hole. He now looks forward to another great auction in 2011. The April 2010 issue of Grays Sporting Journal has featured the oil painting "Sunrise on a Favorite Stream" on a two page-spread to illustrate an article by John Gierach. This very peaceful image can be viewed at pages 8 and 9 of the publication and depicts an angler in the early morning light. Gray's Sporting Journal Features "Remembering A Trip Up North"
The February/March issue 2010 of Gray's Sporting Journal featured Adriano's still life painting "Remembering a Trip up North" on their back cover. It looks great! This painting on panel measuring 25.5"x23" was sold at last year's Coeur d'Alene Art auction in Reno, Nevada. Adriano recently received the news that he was inducted into the Fresh Water Fishing Hall of Fame. The organization recognizes individuals and artists for their contribution, dedication and service to the fresh water sport fishing industry. He joins the likes of Ogden Pleisner and Chet Reneson. The Museum is located in Hayward, Wisconsin. “Jackson Hole Art Auction, An Auction of Past and Present Masters of the American West” presented by Trailside Galleries and Gerald Peters Gallery, will offer a painting by Adriano Manocchia titled “Memories of The Tetons”. The auction will take place at the “Center for the Arts” will start at 1:00 pm MST (10:00 am Eastern time) at the Center for the Arts in Jackson WY. Information can be obtained by calling 866-549-9278 or logging on their website www.jacksonholeartauction.com. A vintage postcard found by the artist in an antique shop inspired this painting. In this oil on panel a well-used reel lays next to a loved book the angler has just put down. He re-reads a letter he received from a fiend. After taking out one of his reliable flies from the old leather fly wallet he rests them on the book and lets memories of a good day of fishing under the mountains’ shadows, come flooding back. This year research trip bought Adriano once again to explore the wilderness of Yellowstone National Park. Two weeks of hiking and exploring has produced a library of images and sketches the artist will use as reference and transform into evocative paintings in his new gallery space located in a remodeled barn on his Cambridge property. The Park was magical as always and considering it was late July and early August the grass was green and the rivers in perfect condition. Adriano’s friend Rob Parker took time off to take him into the backcountry around Jackson Hole to fish in some of the most beautiful country imaginable. Adriano and his wife also met with Al and Mimi Jorges from Long Island (NY). Al and Mimi are clients and friends and together they enjoyed fishing in the Park. Adriano’s limited edition had-colored etching “Favorite Flies” has been selected as the back cover art for the October 2009 issue of Gray’s Sporting Journal. In this sold-out hand-pulled etching edition the artist has featured five classic flies that have been enhanced with watercolors. July started off with the second Open Studios Tour of Washington County. Adriano’s new space in the carriage barn was ready just in time and it worked out wonderfully. Over 250 people stopped by over the weekend to see the studio and work and sales were brisk. The Saturday afternoon wine reception at the Rice Mansion Inn was extremely well attended by collectors and participant and several work of arts were sold including an original angling landscape created by Adriano. The next Open Studios Tour will take place in 2011. Gray's Sporting Journal Features "Summer Magic"
"Summer Magic" a breathtaking Western riverscape recently created by Adriano, has been featured in the 2009 April issue of Gray's Sporting Journal on pages 10-11. The original oil on panel that measures 24"x36", portrays a dramatic sunset on the Madison River in the Yellowstone National Park. The painting is now part of a private client's collection. Two new small works by Adriano have been accepted for the 2009 American Miniatures Show that will he hosted by Settlers West Galleries, located in Tucson, AZ. This annual invitational event will open on February 14, 2009 and will feature two of Adriano's angling still life paintings, one entitled "Invitation for Next Summer" and the other "Visit to the High Country" as pictured here. Show Curator Lisa Revet of Fine Art in The Village located in Hoosick Fall, NY will showcase a selection of works by Adriano in time for the Holiday Season. Ranging from equine landscapes and still life, to angling scenes, the show, which also includes artwork by other internationally known artists, was featured in the December 2008/January 2009 issue of "The Country and Abroad" which highlighted Adriano's art. In a feature which appeared in the December 2008/January 2009 issue of the publication Country and Abroad, the artwork of Adriano Manocchia caught the attention of the editorial staff of this established publication. Two of Adriano's images were selected for the feature that included information on the Fine Art in the Village Gallery events. In the November/December 2008 of Gray's Sporting Journal a hunting still life painted by Adriano was selected to illustrate one of their stories. The full page spread really captured the exquisite characteristics of "His Favorite Decoy"
The American Museum of Fly Fishing located in Manchester, VT will feature recent works by Adriano Manocchia at their invitational exhibit "Angling and Art Along... the Batten Kill". The benefit auction that will benefit this educational, non-profit institution dedicated to preserving the heritage of fly fishing around the world, will be held at the historical site of Hildene on Friday, October 24, 2008 starting at 6:30 p.m.
H2O Magazine, an exquisite travel and fishing new publication from Italy, has featured Adriano's art in their Summer 2008 issue. The article entitled "La Pesca nell'arte: Adriano Manocchia" contains several paintings along with an editorial on the artist written by Editor in Chief Giorgio Cavatorti. Dr. Cavatorti is also the director of the "Museo Internazionale della Pesca a Mosca" (International Museum of Fly Fishing) In Castel di Sangro, a city located within the spectacular National Park of Abruzzo and along the Sangro River, noted for its abundant wild trout population. A painting by Adriano was featured at the 8th annual art exhibit "L'Arte della Pesca...La Pesca nell'Arte" The Art of Fishing...Fishing In Art) held in Castel di Sangro (Italy) during the SIM Fly Festival now at its fifth edition and considered the most important Fly Fishing event in Italy. Curated by Lino Alviani and organized by Osvaldo Galizia President of SIM, and Giorgio Cavatorti Museum of Fly Fishing Director, the exhibit will travel to Austria and then to Forlì (Italy). An oil painting by Adriano titled “Sounds of a Mountain Stream” was juried to be part of the Art of The Animal Kingdom XIII show at the Bennington Center for the Arts in Vermont. This annual invitational event has become the Bennington Center for the Arts’ signature show and attracts some of the most renowned names in the wildlife art field. This magnificent painting features a majestic elk standing in a pool of light by a river’s bank in Yellowstone National Park. A powerful angling still life painting by Adriano entitled "High Country Memories" and measuring 13.5"x18.25" will be auctioned off at the 2008 Scottsdale Art Auction In Scottsdale, AZ on April 5th. This invitational event features important works by deceased and contemporary artists well-known for their renditions of Western & Sporting Art. Also on auction will be a collection of Native American Art. Two of Adriano's angling still life paintings selected for the 2008 Settlers West American Miniatures Show were sold during the event. This represents the third successful year of Adriano's participation to this prestigious show. Two exquisite angling still life paintings by Adriano were selected to participate at the invitational 2008 American Miniatures Show that will be held at Settlers West Galleries located in Tucson, AZ. The exhibit and sale will start on February 9th 2008. The first of the angling still life oils on board is titled "Invitation From A Friend" and measures 9"x15". The dimensions of the second painting titled "Trying a New Pattern" are 9"x14". A duck hunting still life titled "Fall Essential" and the angling still life painting "Start of a New Beginning" were featured in the Sportsman's Gallery and Paderewski Fine Art 2007 catalog, Volume XIII. In celebration of their 70th anniversary, J.N. Bartfield Galleries of New York City have issued an outstanding catalog featuring works by Masters and selected contemporary artists. "Hugging The Rock" an angling landscape by Adriano measuring 12"x16" was sold shortly after the catalog's release. The Fine Books gallery also offered an incredible selection of rare collectible books. Adriano's angling still life entitled "Season's Almost Here" sold at the record price of $16,800 during the prestigious 2007 Coeur D'Alene Art Auction held on July 28th in Reno, Nevada. This painting that measures 20 1/2" x 19" generated lots of interest with several collectors resulting in a very animated bidding session. The cover of the Summer catalogue from The Sportsman's Gallery in Beaver Creek, Colorado features a wonderful angling oil painting by Adriano. The painting depicts a tranquil summer day with a fly fisherman "Chasing Summer Brookies" on a small western stream. This new painting by Adriano measures 16" x 22" and is available esclusively through the gallery. The cover of the July issue of Fly Fishing Guide features Adriano's oil painting "Early Morning Magic". The painting depicts an angler fishing by the Eagleville Covered Bridge on the Battenkill River. A wonderful angling still life painting entitled, "Season's Almost Here" by Adriano is included in the prestigious Coeur D'Alene Art Auction on July 28th in Reno, Nevada. 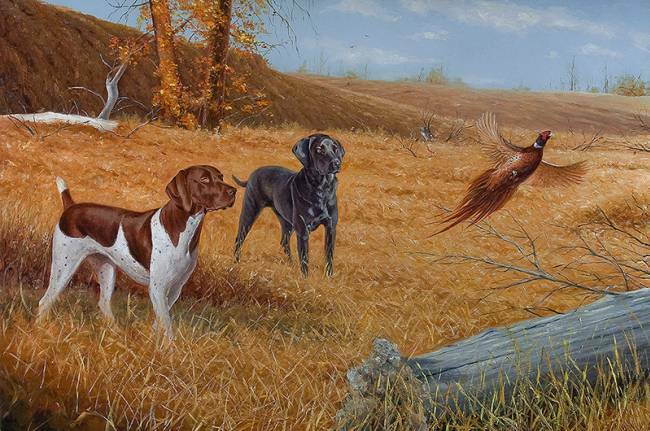 The painting measures 20 1/2" x 19" and was featured on the back cover of the April 2007 issue of Gray's Sporting Journal. The oil is lot number 194. Adriano has joined eleven other artists from Washington County for the first annual Open Studio Tour of Washington County. The tour, Saturday and Sunday, July 21st and 22nd, will highlight some of the finest sculptures, painters and artisans of the area. Studios will be open from 10am to 5pm. A very evocative landscape by Adriano, called As the Fog Disappears was featured on the inside back cover of American Angler. Gray's Sporting Journal has featured a magnificent still life painting by Adriano on the back cover of their April 2007 issue. The oil on panel is entitled Season Almost Here. A still life painting by Adriano, entitled Early Treasures was sold at the invitational American Miniatures Show at Settlers West Galleries, located in Tucson, Arizona. This is the third year that Adriano has successfully participated in this prestigious show. A till life painting by Adriano titled" The Place I'd Rather Be" graces the cover of the April 2004 issue of the New York State Conservationist and a second one was used to illustrated their article "Choice Flies of the 1880s". The NY Conservationist is the official publication of the Department of Environmental Conservation for the state.